Industrial laminates are made up of superimposed layers of reinforcing materials that have been impregnated with resinous binders and cured under heat and pressure. The portions of reinforcements and resinous binders that are added alter the properties of these materials. Further alterations are accomplished by the addition of plasticizers, lubricants and flame-retardants. These paper base laminates are generally applied where electrical rather than mechanical properties are of dominant importance. Phenolic is the most common resin system in paper base laminates. Cotton cloth laminates are usually chosen when mechanical strength greater than paper is required. A fine weave cotton is often used when machinability is important. Phenolic is the most common resin system in cotton base laminates. Glass fibers as woven fabrics or mats produce the highest-strength laminates. They also have superior electrical properties (maintained under high temperature and humid conditions) and high temperature resistance. Resin systems include phenolic, melamine, silicone, and epoxy. 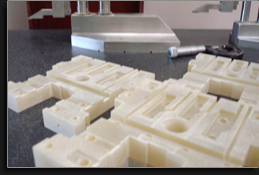 FPI distributes materials in a variety of basic shapes, and can customize the materials with CNC machining and fabrication. Many variations of high pressure laminates have been standardized, resulting in the establishment of more than 70 standard grades of laminates. If more than one standard grade possesses the required properties, final decisions can be made by considering the most suitable form and by analyzing the economic aspects relating to that laminate grade and its machinability.